Duelists, beware! 19th April, 2018 shall forever be known as the day that Darkest Diabolos and the terrifying tyrants of torment descend upon the earth in Yu-Gi-Oh! TRADING CARD GAME Structure Deck: Lair of Darkness! These wicked shadow lords boast immeasurable power, but demand heavy Tribute from any Duelist who seeks to wield it. Fortunately, villainy is the norm in the Lair of Darkness, and these monstrous dukes of deception aren’t that picky about whose monsters are being Tributed as long as this new Field Spell is in play! Monsters Tributed while Lair of Darkness is in play will find no rest in the Graveyard – their souls will return to the field at the end of the turn in which they were Tributed. Yu-Gi-Oh! 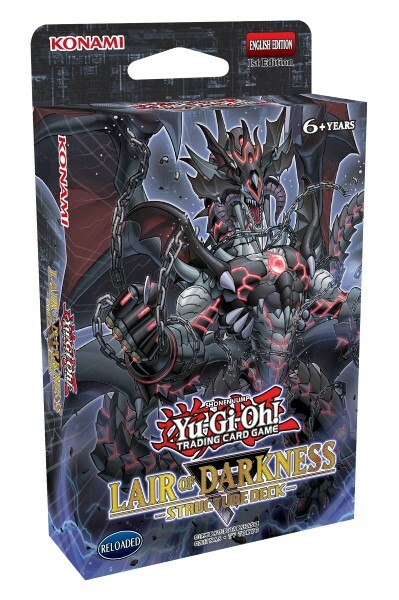 TRADING CARD GAME Structure Deck: Lair of Darkness is playable right out of the box, but many of its cards are right at home in Decks built using monsters from the upcoming Yu-Gi-Oh! TRADING CARD GAME Dark Saviors special booster set as well!